"...apes are in fact a contemporary relative of ours, NOT our ancestors." The late Rene Dahinden recorded on a personal tape recorder the speech given by Calgary resident Dr. Pavelka that was presented locally in British Columbia. I don’t recall that he ever mentioned the date, but it had to be at some point in the mid to late 1990’s when he contacted me. In the course of those days, Rene sent me an audiotape copy of a presentation by Dr. Mary S. McDonald Pavelka, B.A., MA (Mc Master), Ph.D. She was at the time a physical anthropologist and well-known professor of primatology at the prestigious University of Calgary in Alberta, Canada. If this quadrupedal (4 legged) ancestor gave rise to humans and gave rise to the great apes, why did the split happen? Moderator: "How closely related are we to the great apes?" Moderator: "Is it possible for an ape to evolve into a more human form?" ... for the record here, my impression was that Rene recorded this at some point in 1990's, the cassette was not dated, only labeled by name.... how timely it is to mark Dr. Pavelka's words today in research, April 17, 2010... Bobbie Short. This is a good question, and luckily one that can be partially answered by available fossils. The answer is essentially yes. The foot is not very well known for Homo erectus, as far as I know, but there is a nearly complete foot of the more primitive Homo habilis from Olduvai Gorge (see picture). 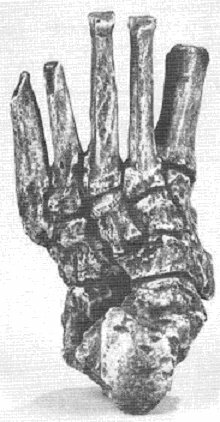 This is the earliest known species of Homo, and here there is an essentially modern foot although the phalanges are not preserved. Now, it is not identical to Homo sapiens, but it is quite a departure from the foot anatomy seen in Australopithecus. In Australopitheus, the foot has obvious adaptations for bipedalism, but it retains such primitive features as long and curved toes. The great zoologist Richard Owen once wrote that "...the human foot is the most characteristic peculiarity in the human body." And finally, this note from anthropologist, Dr. Louise Leakey on assignment in Nairobi, Kenya affiliated with Stony Brook University. In an interview with a journalist from the American Statesman after the Texas Bigfoot conference Dr. Sarmiento is quoted as saying; "...if Bigfoot exists in North America, it is the closest living relative to human beings!" One analyst, British biomechanics specialist Dr. D. W. Grieve, wrote, "the cycle time and the time of swing are in a typical human combination but much longer in duration than one would expect for the stride and the pattern of limb movement" - meaning that if this is the correct film speed, the figure's "neuromuscular system was very different to that of humans." In other words, the figure is not a man in an ape suit, and the "possibility of fakery is ruled out." At 24 feet per second, however, it "walked with a gait pattern very similar in most respects to a man walking at high speed."